A household is so much more than just a place to live. A house is a home; a place where family members and friends alike can live and spend time together, building each other up and helping one another out through life’s adventures. From the heart and soul of the kitchen to the comforting rest of the bedroom, homes are where memories are created and relationships are developed. After all, at the end of the day, people don’t usually say that they’re going back to their house; they say that they’re going home. Given the sentimental value of our homes, it only makes sense to protect them in case something unexpected occurs. Aside from the people inside a home that really make it special, your average home also possesses considerable financial value. For the average Ottawa and Stittsville resident, their home is one of, if not the most, valuable asset they have. While it’s impossible to replace old photographs and various sentimental items lost to a fire, flood or burglary, knowing that your home is properly insured is priceless in and of itself. Here at Bradley’s Insurance, we’re well-versed in bundling auto and homeowners insurance in Ottawa, providing Stittsville and other local communities with honest, reliable and trustworthy homeowners insurance policies for years and years. In the interest of better informing our fellow neighbors about the ins and outs of homeowners insurance, below we’re going to cover some important information about homeowners insurance claims in Ottawa and the surrounding area. In particular, we’re going to focus on water damage claims. As always, if you have any questions about home and auto insurance or any of our comprehensive insurance services, Bradley’s Insurance is ready to chat with you! Contact us today to learn more. Why Are Water Damage Claims So Important? Put simply, water damage is one of the most common causes of home insurance claims in Ottawa and in other places around the world. While water damage is preventable in many cases (more on that below), the unexpected can and does happen. Of course, that’s why insurance services exist, in order to give you a peace of mind and protect your assets against natural disasters (flooding, in this case). According to the ISO (International Organization for Standardization), water damage claims are the second largest frequent insurance claim, followed by wind and hail damage claims. While water damage claims have a well-established history with many homeowners, the percentage of claims related to water damage is increasing while other causes of damage have stayed fairly consistent or have even decreased over the years. Beyond homeowner negligence, it is not clear as to why water damage claims are on the rise. Despite this, more and more people are asking insurance professionals questions about water damage and what is and isn’t covered by their homeowners insurance policy. 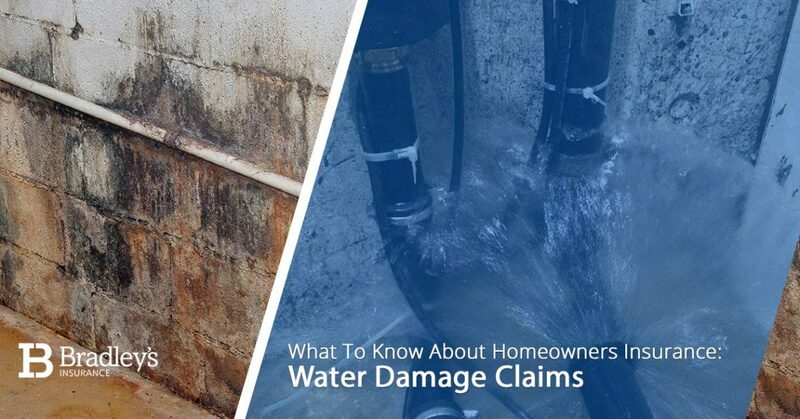 When looking at these different types of water damage, the most important thing to homeowners is what’s covered and what isn’t covered by their policy. A leaky roof can be rather costly coming out of pocket, and a leaking toilet is nothing but an inconvenience, to say the least. All things considered, when it comes to insurance coverage, the type of policy you have and whether the water damage is accidental and sudden or gradual will determine whether or not you’ll be covered (in most cases). Something is considered gradual damage when it happens slowly over time, and the homeowner(s) may or may not be aware of the issue. When it comes to insurance claims, gradual damage as a result of water damage is rather common. In our busy day-to-day lives, we might pay too much attention to the behind-the-scenes of our home, but that doesn’t change the fact that homes are full of nooks and crannies, pipes, electrical wiring, ventilation systems, and so on. Our point is that home are complex structures and without the proper maintenance and regular verification by professionals to make sure things are looking A-OK, you might not know that something is wrong with your house until it’s far too late. Of course, it’s usually at the point of no return where most homeowners file a water damage claim. If the damage is not accidental or sudden, like in the case of a natural disaster, long-standing water damage that went undetected for a long period of time might present problems when filing your claim. A prime example of preventable water damage is when families leave on a trip for several days and don’t turn their water valves off. If anything leaks while you and your family are away, turning off your valves will limit the amount of overall damage that occurs. Frozen pipes as a result of turning off the heat can also cause excessive water damage, a problem that’s only exacerbated when you’re not around to notice or deal with it. Many people are frustrated when their claim is denied, thinking that the water damage was a result of something sudden and unforeseen when in reality, the water damage is a result of something that’s been happening over an extended period of time. Here’s a good takeaway point: Insurance is meant to cover sudden and accidental damage. By definition, sudden and accidental damage means that whatever has happened should not have been the result of damage over time. Plumbing, faucets, or pipes leaking, thereby causing damage to walls, floors, etc. So, When Does an Insurance Company Cover Gradual Damage? Unfortunately, there’s no universal answer when it comes to this question. It’s possible that you can figure out what an insurance company will and will not cover based on the policy wording. Of course, your friendly Ottawa home insurance advisor here at Bradley’s Insurance would love to answer any questions about your homeowners insurance policy or other related policies. After all, our goal is to be transparent and highly accessible to our valued clients and greater Ottawa community, so by all means, feel free to reach out to us! If you own a home (and a car!) in Stittsville and the greater Ottawa area, it pays to have a reliable and integrity-driven insurance service. Having served Stittsville for multiple decades, Bradley’s Insurance has worked hard to earn our local reputation as the area’s preferred home and auto insurance provider. We also provide many other specialized insurance policies, and we’d be happy to discuss them with you. Get in touch with Bradley’s Insurance today to learn more about water damage coverage, homeowners insurance policies in Ottawa, and more!